College drinking games: having the time of your life getting drunk! College Drinking Games - forever young, forever drunk! 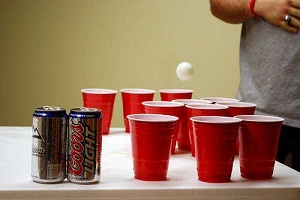 College drinking games are a great way to liven up any party. They can be games of chance or skill. They can be played with cards, dice, balls, voices, or bodies. They always, however, involve a tasty beverage that will eventually make you forget your own name! 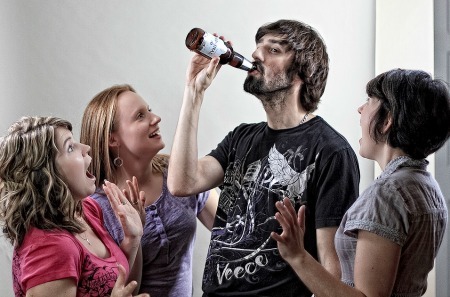 The hidden truth to college drinking games is that they are there to help you pace yourself. I'm sure you never would have expected that one! 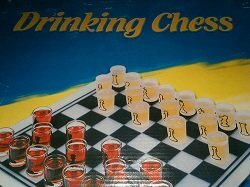 The drinking might be the point of the thing, but it is the downtime imposed by the game's rules that will help you drink all night and remain at a pleasant level of intoxication while having a great time. Nothing is more frustrating than waking up with a headache and hearing that you have missed half of a great party. When most people think of beer drinking games, they think of either watching a movie or television show and taking a drink at appropriate moments, like when one actor shows up or a common catch phrase is said during the film. Or, they think of the king of all college drinking games: Beer Pong. Beer Pong is almost a staple of fraternity life and a favorite on college campuses, only equaled by the power hour drinking game﻿. It even has its own national championship held in Las Vegas every year! This game can get you drunk very quickly if you have a good opponent. It is usually played on a ping pong table or on two card tables a fair distance apart from each other. Five or six feet will do. Fill a few small cups with beer and set them out in a regular pattern on the table. Three to six cups is standard, placed in a pyramid pattern. The objective of the game is to bounce the ball from your side into one of your opponent's cups. If a ball lands in a cup, whoever owns that cup chugs the beer inside. Whoever runs out of cups first loses. There is also a variation where whoever hits a cup makes his opponent drink. For a more sedate time, there are plenty of verbal party games to play. The most popular one being Never Ever Have I Ever. Cardinal Puff and Fuzzy Duck are two silly games guaranteed to get laughs. The players sit in a circle and pass around sentenses. Anyone who screws up takes a drink. This obviously does not get any easier the more you had to drink! The Cardinal Puff drinking game is a counting game. There are several variations of this game but they all involve a lot of phrases and gestures designed to make you fail and take a drink. Players say, "I dedicate this drink to Cardinal Puff!" and take a drink. Then they tap the table, the underside of the table, each thigh, and the glass. Feel free to do your own thing since nobody can agree on what gets tapped. Just make sure there are several taps and snaps and other gestures involved. Each subsequent round adds a "Puff" to the phrase along with another tap. So in the second round, "Cardinal Puff" would become "Cardinal Puff Puff" and everything would be tapped twice. This is a game that can get very silly, very confusing, and you - very drunk! Fuzzy Duck, on the other hand, is just a phrase repeated around the circle. Each person says "Fuzzy Duck" to the person on his or her left. Anyone who doesn't say it properly takes a drink and starts the next round. Players can answer back "Does he?" At that point, the phrase turns into "Ducky Fuzz" and passes to the right. As you can imagine, the phrase doesn't stay "Fuzzy Duck" for long. There are hundreds of college drinking games using cards floating around, the most popular being President, but any game can be turned into a great college drinking game! Check out the big collection of drinking card games. Just add drinks when specific things happen, such as taking a piece in checkers or having to "go fish." It's easy to play, you just need two players, a lot of glasses, some nice drinks and a cunning game of chess. When he loses a chess piece.This makes the game faster the longer it goes! When he wins a chess piece.This makes the game harder to win! So, grab a game, grab some friends, grab some drinks, and you are ready for playing college drinking games at your party! As always, please drink responsibly. Beware the hangover the next day! Check out these great resources for even more drinking game ideas! The website Spartan Drinking Games has a wide array of college drinking games. They are even explained with videos! Drop by and drink a fresh one with those fun guys! Share your favorite drinking game! What do you love to play to get absolutely buzzed?